In Destiny 2 there is a shop that sells in-game items for real money.1 In that shop there is a vendor. Her name is Tess. Tess knows a thing or two about psychology. Well, three things at least. 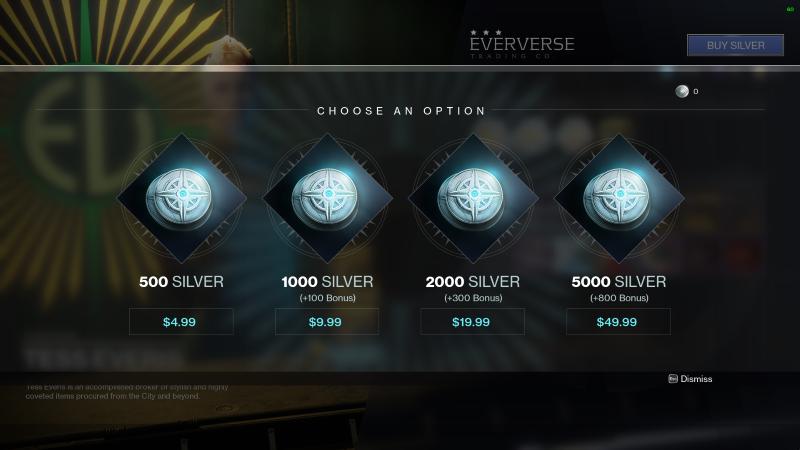 Like most big games with an online focus, Destiny 2 lets players buy cosmetic items with “silver” which is an in-game currency that can be exchanged for real world money. This is a nice little revenue stream for Activision Tess, so like any effective salesperson she’ll a few tricks to get you to buy some silver and spend it. Your friendly Eververse representative is here to help. Isn’t that nice? One of the first things I noticed is how Tess invokes the norm of reciprocity. At a few points in the campaign an icon is placed at Tess’s store, telling the player that he or she has something to gain by talking to the NPC. Indeed, Tess has a free bright engram gift for you, which can be opened (decoded, whatever) to reveal some sweet cosmetic items! Tess even tells you something along the lines of how she appreciates your heroic efforts and wants you to succeed against Earth’s enemies. And according to the psychological principle of reciprocity, you may feel a little obligated to pay back the favor by doing a little shopping. The second psychological sales trick that Tess Everis seems to know is that you probably spend silver more freely than real money. 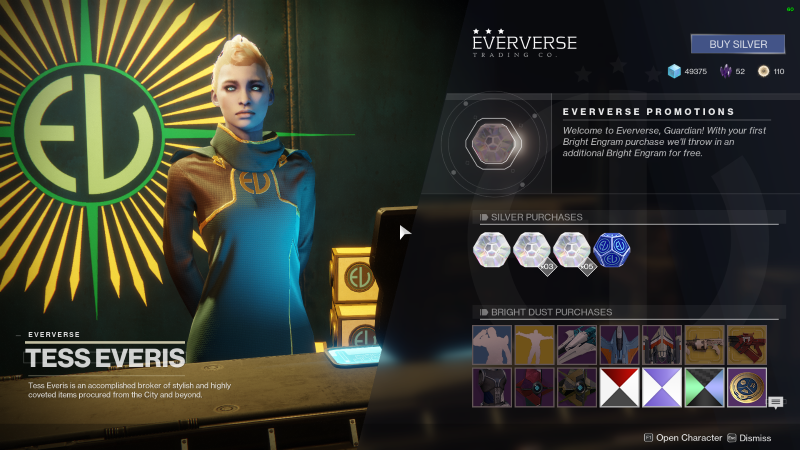 A long line of consumer psychology research has shown that we spend more when we are using store credit, which is basically what Destiny 2’s Silver is. Back in 1998, Drazen Prelec and George Lowenstein published an important paper where they proposed a thoeory about how people experience the displeasure of paying for something.3 Paying money for something causes displeasure or pain. If our expected pleasure from the purchase outweighs the pain, then no problem. But if it doesn’t, then we’re less likely to make the purchase. One way that retailers have figured out to reduce the perceived pain of a purchase is to disconnect thoughts about the payment from thoughts about the purchase. Okay, I’ll give you some credit here, Tess. So to speak. But things like Destiny 2’s silver are the least transparent at all. Figuring out how much Silver translates to in real money involves math that most of us won’t bother with. How much did those 500 Silver you just bought? Well, you paid $5 for 500 Silver, there’s 100 cents to the dollar, so …wait. This math isn’t very hard at all. It’s basically one cent per silver. Y’all. Tess done screwed up on this one. Guess she doesn’t know all the tricks after all. Either that or she’s showing a bit of restraint. Let’s hope for the latter and give Activision a thumbs up for this one. 1. Well technically it sells items for fake money that you have to buy with real money, but you know what I mean. 2. Cialdini, R. (2001). The Science of Persuasion. Scientific American. February 2001. 3. Prelec, D., & Lowenstein, G. (1998). The Red and the Black: Mental Accounting of Savings and Debt Marketing Science, 17(1), 4–28. I’m sure you realize it, but engrams are also a currency. It’s $->silver->engram->[loot]. Tess’s free engram is little different than a social/mobile F2P game tutorial or new-user-experience showing you how to spend premium currency by gifting you some that must be used immediately. The silver math isn’t difficult in US dollars, but for other currencies it is. For example, 2000 silver (plus you get a 300 bonus, so essentially 2300 silver) in GBP is ￡16.79, in AU$ is $29.95, and in CAD is $26.99. This is all taken from the Microsoft Store, where the USD prices (at least) are the same as the in-game prices. Further to the above, maybe also the 300 bonus serves to skew judgement when the exchange would otherwise be 1:1? So in USD 2300 silver for $20 is more confusing.